A new report prepared for the European Commission presents the way for more sustainable batteries by exploring how new battery technologies could be designed to ensure strong performance with minimal environmental impact. Design features which make batteries easier to reuse and recycle are key, it argues. The report, Towards the Battery of the Future, also offers a glimpse into some of the battery technologies we could be using in future, discussing the environmental benefits and issues they bring. The importance of batteries to our future is difficult to overstate. High-quality, innovative batteries are critical in efforts to cut greenhouse gas emissions through their role in storing secure supplies of low-carbon energy from renewable sources for our homes, businesses and vehicles. Batteries are also hugely important in helping power the expanding digital economy and an ever-growing number of portable electronics. The pursuit of commercially competitive, high-performance batteries needs to go hand-in-hand with the quest to lower their environmental impact. The report explores a range of impacts exerted by current battery technologies that should be addressed by future designs. These include their greenhouse gas emissions, use of raw materials, toxicity and safety. Choosing the right materials to make electrodes is one of the most important considerations for both performance and sustainability. We cannot rely on existing natural reserves of key ingredients for lithium-ion batteries – the most quickly growing form of technology on the battery market – in the long term, or in the event of a dramatic increase in demand. In time, raw supplies of these materials, including lithium, manganese, cobalt, nickel and natural graphite, are likely to dry up or suffer obstructions in vulnerable supply chains. Packing as much energy as possible into a battery (that is, increasing its energy density) can provide a win-win solution to relieving pressure on resources and boosting the performance of batteries. A high-energy density can enable smaller, lighter batteries which need recharging less often, while also minimising the amount of material used overall. Moreover, many environmental issues presented by batteries can be mitigated, or even overridden, if batteries are effectively reused and recycled. These circular economy approaches to end-of-life treatment avoid many impacts of producing batteries, including greenhouse gas emissions, air pollution and resource use. However, not all batteries are easy to reuse or recycle, notably lithium-ion, which has components that are difficult and energy-intensive to separate. A major change in the mindset of new battery development is recommended by the report, in which ease-of-disassembly for recycling and reuse is built into the design of batteries from day one. The report also outlines three novel technologies that we are likely to be using in the near future. Solid-state lithium batteries promise greater energy density and safety than existing lithium-ion technologies, while vanadium redox flow could come to be the predominant energy storage battery technology for stationary applications. Printed batteries, also explored, open up possibilities for a new generation of electronic devices, such as key components for the expanding Internet of Things. 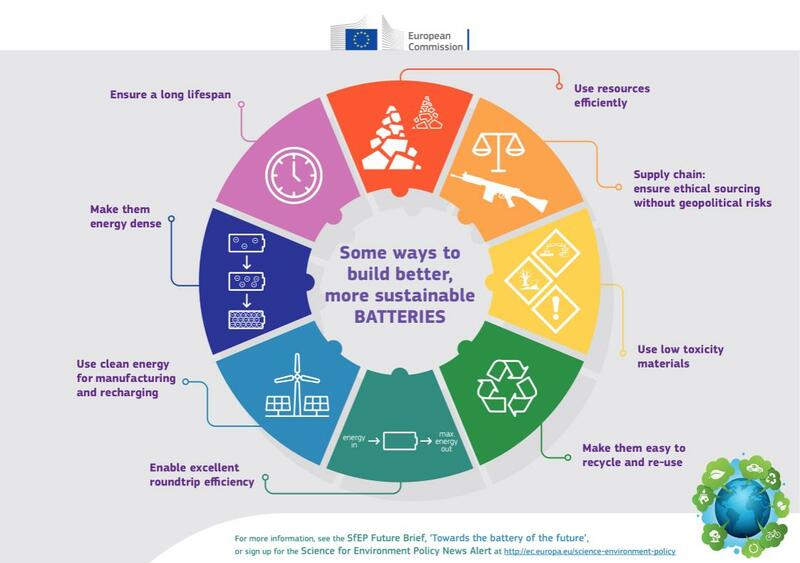 Towards the Battery of the Future was produced by the University of the West of England (UWE) for Science for Environment Policy, the free news and information service from the European Commission’s DG Environment. It is published in the context of the European Commission’s proposal that the EU takes up the challenge of becoming a global leader in sustainable battery manufacturing. In support of this ambitious goal, the European Commission convened the European Battery Alliance cooperation platform in October 2017 and endorsed a Strategic Action Plan on Batteries in May 2018 as part of the Europe on the Move package of sustainable mobility initiatives. The report is also highly relevant to the Batteries Directive, the only piece of EU legislation dedicated exclusively to batteries, which is currently under review. Socotec, a UK provider of testing, inspection and compliance services, has been awarded a two-year fuel quality testing contract by Biffa. In addition to PAHs, the European Chemicals Agency (ECHA) will continue to look into the possible health impacts of other substances contained in the granules and mulches derived from end-of-life tyres (ELTs).